Celebrate the Music and Legacy of Ronnie James Dio! 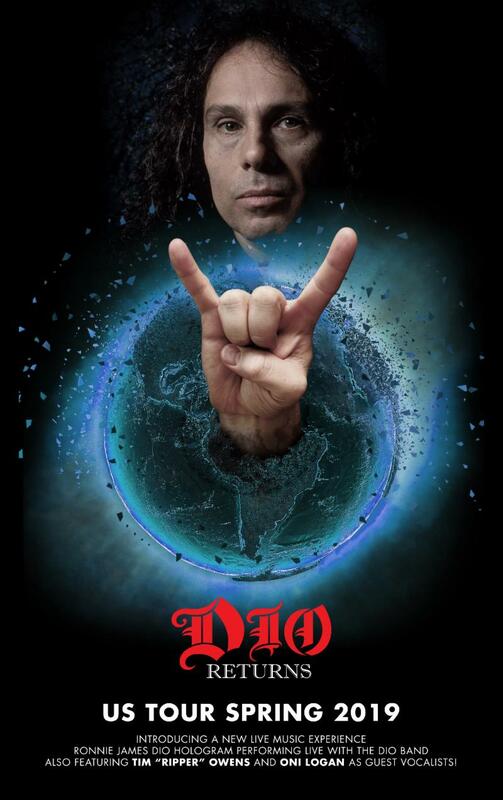 The DIO RETURNS Tour featuring the Ronnie James Dio hologram – is finally coming to the United States this spring and summer! The DIO RETURNS U.S. Tour will feature a line-up of DIO bandmembers of 17 years performing aside the stunning Ronnie James Dio hologram. This 90-minute celebration of Ronnie James Dio will include all of the great fan favorites – such as “Holy Diver”, “King of Rock N’ Roll” and “We Rock” – taking fans on a DIO journey from Rainbow to Black Sabbath, to his own DIO material – with the legend himself! The DIO RETURNS Tour will begin May 31, 2019 in Ft. Myers, FL and visit a month’s-worth of cities, with more dates set to be announced. Tickets for all confirmed tour dates go on sale this Friday, April 12 at 10:00 AM local time via all major ticketing outlets. For more information, please visit www.ronniejamesdio.com/tour.html. In August 2016, Eyellusion surprised fans when it debuted the Ronnie James Dio hologram at the Wacken Open Air heavy metal festival in Germany. The hologram was also tapped to open the 2017 Pollstar Awards, wowing bookers and promoters in attendance and creating excitement for the forthcoming tour. Most recently in December 2017, thousands of fans in Germany, Poland, Spain, Romania, the UK, Netherlands, and Belgium experienced DIO like never before via the DIO RETURNS tour. For more information on the DIO RETURNS U.S. Tour 2019, please vist www.ronniejamesdio.com, or the social media sites below.